The moon is the feminine yin to the sun’s masculine yang energy. Women are changeable like the moon. We are attuned to the moon's energy as it moves through its 29.5 day lunation cycle, the same approximate time of a woman's menstrual cycle. In this e-course we will follow three moon cycles to better connect to our most divinely feminine selves. This course is designed so that you may work with a different goddess at the start of each lunar month (although in the first of the three courses you will meet two goddesses and work with them together). You receive an e-book with images, instructions, wisdom, lore, journal prompts, rituals, ceremonies, altar-making, totems, a guided journey to meet the featured goddess, a tutorial of an art process or craft related to the goddess of that cycle, and other surprises (this delicious offering includes written as well as audio and video material). The Goddess Temple teachings were originally designed to commence on specific new moons and last one lunar cycle or month. However, as a self-study course you can now take them when it works best for you and take as long as you like, although starting on the New Moon is still a good idea. The New Moon phase of the lunation cycle is the time of The Maiden, of birth, beginnings, initiation, taking a leap, starting anew, discovering and learning. The Cancer New Moon is one of watery feelings and family connections. It is the moon of the Mother Goddess. What better time to embrace the love and giving energy of the two Marys, the Virgin Mary, mother of Jesus, and Mary Magdalene, wife and consort, first apostle, and power in her own right. We will explore these two goddesses together (some say they may have been one) as examples of the embodiment of earth and spirit, spirit into matter, and the energy of our heart chakra. For Mother Mary represents the spiritual and Mary Magdalene the earthly aspects of the Goddess. We will explore these two dimensions of Mary which, in concert, reflect our own completion and wholeness as women of body, mind, soul, spirit. In the Christian tradition, Mary has stood in for the ancient goddess and reminds us of the Great Mother's deep roots. Many churches devoted to Mary the world over are built on sacred ground where temples to the goddess once stood. Try as it might, the Christian patriarchy could not squelch Her or diminish Her and, in fact, had no choice but to raise her up as an important icon because the people would not relinquish Her. We will explore her meaning as a Virgin Goddess and her power as a miracle worker. Mary Magdalene has been a maligned and misunderstood goddess, thanks to the patriarchal church fathers and their refusal to see her power and divinity as Jesus Christ's wife, apostle, and equal. They tried to besmirch her name and reputation by branding her a harlot and a sinner. Their attempts to diminish her importance to Christ and his teachings drove the apocryphal knowledge of her power underground. 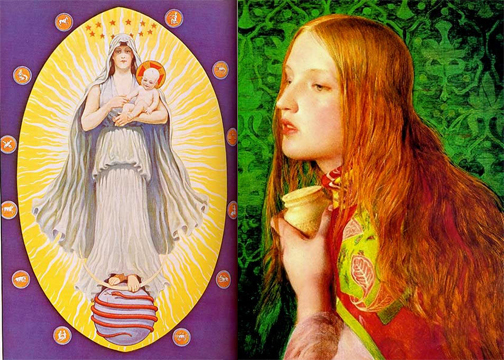 In the esoteric teachings, we learn that it is very likely the Magdalen was a priestess who brought her own power to Her relationship with Jesus as his feminine counterpart. We will get to know and work with the Two Marys and discover how together they provide a holistic view of woman. We will be instructed on how to make a goddess rosary with luminous guest artist Jennifer Mantle, who creates and sells rosaries and who wrote her master's thesis on "Circling the Goddess: Reclaiming the Rosary in Her Name." No matter what your relationship to Mary has been, you will discover new ways to see Her and bring Her into your life throughout the lunar month and beyond. The Leo new moon is one of fire, of shining your light, expressing yourself, creating, leading, and facing and expressing fiery emotions like anger and passion. The word, Sekhmet, means “powerful.” Like the Hindu goddess, Kali, she had to be stopped from destroying humanity after she became disgusted with its tolerance of evil, and therefore teaches us how to both release and temper our anger. Sekhmet guides us in strengthening our Solar Plexus chakra by helping us stand in our power and not give our power away to others. Sekhmet helps us understand when our anger is appropriate and righteous and when it is not, as well as how to release it without destroying ourselves or others. 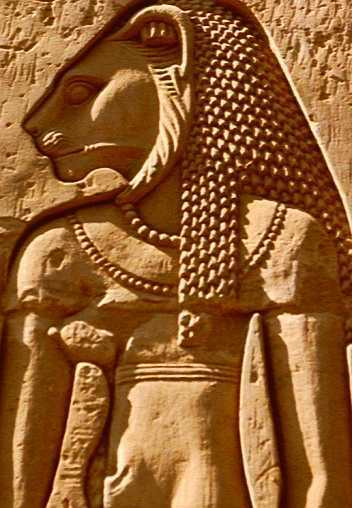 Sekhmet with the head of a lion and the body of a woman, is considered both the wild twin sister of Bast, Egyptian cat goddess and of Hathor, goddess of joy and pleasure. While some saw Sekhmet as the evil twin to Bast's benign, tame cat, or to Hathor's dancing goddess, Sekhmet contains these dualities within her. She is associated with the healing arts and is seen as a Mother and Warrior Goddess who can be fierce if need be or sanguine in her role as protector. Leo is concerned with the dramatic arts and as such can be a star who lights up any stage she walks on, and in her shadow element, a bit of a drama queen. With Sekhmet’s help, we will explore both the light and dark sides of this feline, feminine goddess, how to best harness our power and use it in lion-hearted ways that serve us and the world. This lunar month we will be painting Sekhmet with the radiant mixed-media guest artist Lisa Tuchek. Virgo is the sign of the virgin goddess who is sovereign--whole unto herself. She is the priestess, like Guinevere, who became queen: the sacred feminine counterpart to Arthur’s sacred masculine. The king is powerless without the queen, and Guinevere reminds us of the importance of accepting and owning our power and not giving it up to anyone (sovereignty of the self), and of the balance achieved through sacred right relationship. During this lunar month, we will explore what it means to be both priestess of the mysteries and queen of our own domain, as well as how the divine feminine and masculine work together within ourselves and in our relationships--as within, so without. The teachings of this goddess lead us to explore the fourth aspect to be considered in addition to the triple goddess of maiden, mother, crone: that of the queen in her mid-life power and the wisdom and sovereignty that come with it. This is the energy of the Sacral Chakra, the place of creativity, emotions, sexuality, and sensuality that allows us to engage in the sacred work of the priestess. 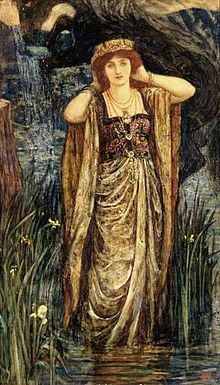 During this lunar cycle, we will explore the mystery and magic of Avalon and Guinevere’s complex story. In addition, you will be encouraged to create a marriage ceremony between the inner masculine and feminine, and to make SoulCollage cards to reflect these parts, led by Stephanie Anderson Ladd. Additional self-study courses are available!